Today's thursday tip is about health. 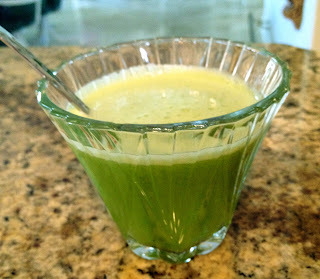 And to be more precise about my green juice. As I was browsing on my netflix documentary folder, a movie catch my attention "Fat, sick & nearly dead" and of course as a curious person I decide to watch it. It opened my eyes. The movie made me discover the world of juicing which I had no knowledge about. I was so excited I showed the movie to the whole family and I recommended it to everyone I knew. So watching it and liking it was not enough, I wanted to really start drinking juice especially the green one. So I tried the recipe of the movie and it was not that tasty so added some green grapes and it made a big difference, not only it was nutritional but tasty as well. It's been now about 6 months that I drink green juice almost everyday and I feel great. Green juices are the best medicine we can give our bodies. Here are some good reasons to start green juice TODAY : Juicing helps you absorb all the nutrients from the vegetables, it allows you to consume an optimal amount of vegetables in an efficient manner, You can add a wider variety of vegetables in your diet, it helps you regulate your weight and there are many more reasons so if you just google it, you will find so much info on it. Juice all this and drink it on an empty stomach, I like it slightly chilled so I put it in the fridge for 10 min. The quantity will be more than the glass I am showing (my glasses are blue so I needed a clear one to show you and this is the only one I found). I love it and I hope you will too !